Pollsters usually only call landlines. This a problem because many younger folk don't own one. Furthermore, retirees are more likely to be home to answer their landlines. This means polls are skewed in favor of candidates liked by the elderly. Younger people are known to favor 3rd parties more. Sometimes people under 35 or 40 are intentionally excluded from polls (see video below). The justification is that older folk are more likely to vote. This makes polls needlessly unrepresentative. Many polls don't even include 3rd party candidates as an option. They just give the two main candidates and a choice of "other". This biases people towards choosing the candidates listed in the poll. It also prevents 3rd parties from getting the polling figures needed to reach the debate stage. Some polls ignore Independent voters altogether (see video below). They only ask registered Democrats and Republicans. Independent voters represent 43% of the population. This makes such polls woefully unrepresentative. Most pollsters phrase the question in a way that biases the outcome. They say "who would you vote for today?" rather than "who would you like to be President?" (see video below). This means previous polls bias the result of the current poll, because many people vote tactically based on polling data. This creates a self-reinforcing perception of two-party dominance. Asking who people actually want as President would be a truer measure of current opinion. If these five reasons weren't enough for you, let me break it down: this is intentional. The corporate media who run the majority of the polls also fund and receive favors in return from the two main parties. As we learned from Wikileaks, the Democratic Party has a cozy relationship with the media. The same is likely true for the Republicans and Fox News. The corporate media are simply not interested in giving an honest representation of 3rd party support. Just to give an example of how this works; consider the Green Party. Green Party supporters are predominantly under 35, don't own landlines, are typically classed as Independents, and would be more likely than a Democrat or Republican to change their ideal voting preference to vote tactically. The Libertarian Party has some of the same issues, but probably to a lesser extent. In other words, 3rd parties are being under-represented in the polls, and it's clearly intentional. Welcome to the `Hillary Supporter Translation Guide', a page for people who're confused by the vacant ramblings of dangerously uninformed Hillary Clinton supporters. If you've had the misfortune of encountering a Hillbot, you've probably heard them utter one of the phrases below. This page offers a clear and authoritative translation of `Hillspeak'. “She's inspirational and a role model.” “She's female." If you'd like help translating other phrases Hillary supporters use, place them in a comment below and I'll see about adding them to the list. This is a mock conversation between a Bernie supporter (blue text) and a Hillary supporter (red text). It includes parts of real conversations I've had with Hillary supporters, and it hopefully exposes a few of the logical fallacies and biases they exhibit. “OK, but if you only care about the blue team winning, you'd pick a candidate who won’t be abandoned by 50% of Bernie supporters. Furthermore, you'd pick someone who doesn’t have an unfavorable rating of 54%; who isn’t hated by around 80% of independents; who isn’t anathema to young people; and whose primary victories aren’t predominantly in red states that will vote Republican anyway. Your candidate is hated outside your party, and the places that like her will vote full red in the national; not the half red Hillary offers. Nominating Hillary could easily cost Democrats the election. “I'd rather vote for who I want all of the time. That's what democracy means. If Hillary is the nominee, I’m going to write in Bernie or vote Green." "Don't be stupid. If you don't vote for her, you are actually supporting Trump. Is that your intent, to help elect Trump?" "Republicans tell me that if I don't support Trump, it's actually a vote for Hillary. So which is it? How can not voting for either of them somehow be a vote for both of them? Do you see what being a tribal partisan does to the logic centers of otherwise sane minds? Please snap out of it." "You're the one being ridiculous. Hillary is a much better choice." "Really? So you admit you'll lose the election if your far-fetched hypothetical scenario doesn't pan out?" "What? No... I'm saying it will be your fault if we lose. “Oh I get it: you're preemptively blaming me for a Republican victory, and at the same time voting to nominate a Democratic candidate who millions of people despise and have pledged never to vote for?" "You just don't get it. Trump is hated more than Hillary." "Oh, that's a comfort. She might win a contest of who's hated the least! Then again, she might not. So the question is: do you think her defeat will be the fault of people who hate her, or the fault of people who nominated her despite that widespread hatred; rejecting a better liked candidate in the process? I mean, you must know she's not liked, right? So, how about using this real data instead of relying on wishful thinking? Then, you could make a decision based on logic and numbers instead of fantasy and denial." 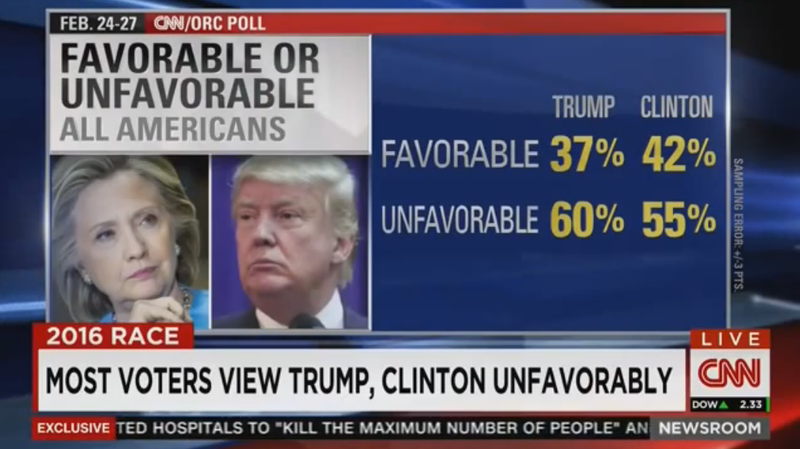 This poll from CNN shows us Hillary Clinton's favorable / unfavorable ratings, which are at an abysmal 42% / 55%. As her ratings within the Democrat party are rather better (19% unfavorable), it's starting to look like Hillary is winning the nomination because all of her support is within the party. Looking outside the party, such ratings suggest a big electability problem looming on the horizon. Independents, who make up the largest voting block in the USA at 40%, appear to despise her. This is the group that any candidate needs to convince if they're going to win an election. Furthermore, she doesn't have the youth vote, who flock instead to Bernie Sanders. It's well known that, the older you are, the more likely you are to vote Republican, so the youth vote is also crucial to a Democrat's success. These key demographics could cost her the election. The only hope for Clinton is that Trump is hated more (and he might be), but, even if Hillary does win, it won't be a big win, and there'll likely be many years of obstructionism from Republicans to follow. The Hillary supporters I've had the displeasure of interacting with want us to ignore this poll. If it can't be dismissed as Republican lies, it must be done away with. These people are willing to risk it all and throw the country under the bus in order to get their candidate the nomination. They're willing to sacrifice the votes of those who've repeatedly said they can't vote for her. Instead, they want to go it alone with their close-knit tribe of loyal Democrats. This is not how you win an election! Essentially, what Hillary supporters are saying to independents and young people is "we don't need your votes". That's their prerogative, of course, but they shouldn't expect me or anyone else to imbibe our own vomit on election day and vote for her. We said we wouldn't; we let you know this beforehand; so if you're not going to listen, it's on you, not us. People who tell you to "vote blue no matter who" but go ahead and choose the least electable candidate are being disingenuous about wanting to ensure a `blue win'. Rather, they're risking it all for their disfavored preference. Why should Bernie supporters have to accommodate their foolishness? So, if it's not Bernie, I'll be writing him in. Voting for the lesser of two evils is voting for an equal or worse choice of evils next time. Voting for Hillary is a vote for war, Wall Street, and wealth inequality. How can I, in good conscience, put my name to that? I've tried to give this corporate, neoliberal, warmonger the benefit of the doubt in the past. I've tried to limit myself to positive messages about Bernie rather than negative stuff about Hillary. A month ago, I even wrote a facebook post defending Hillary against the racism accusations. No longer will I do that. Her supporters are like mini-versions of her: rotten to the core - disingenuous, negative people who take every opportunity to lie or obfuscate the truth. They're the kind of people who don't deserve my restraint or my allegiance at the polling booth. They don't appear to want it either, so I'm happy to oblige. Illegal drugs sometimes harm the people who decide to take them, but that's their choice, isn't it? The primary purpose of a drug is for personal use. It's not for shoving down someone else's throat, or injecting into someone else's arm. Why this should be illegal in any vaguely libertarian country is beyond me. If you want to swallow a gallon of bleach, you can go ahead and do it. It's your body. Guns have a primary purpose that is to harm other people. Whether offensively or defensively, the purpose of a gun is to plant a piece of metal into another person's body at high velocity, causing grievous injury. Why such well-designed killing implements are legal in some countries is beyond me. On this point about guns, not even libertarians should be able to disagree. Yes, we should have freedom over our own bodies and what we do with our bodies, but we don't have freedom to do harm. Guns are for harm. They are a tool for taking away the freedom of others. A tool for harming others. They are an anti-libertarian device. It's useful to consider the evolution of weaponry. When we all had knives and muskets that could maybe be used to kill one or two people per minute, the problems weren't that serious. Today, we have assault rifles, rocket propelled grenades, and other weapons that can kill hundreds per minute. Tomorrow we might have weapons that could vaporize a room of people in a second. What happens then? Do we persevere with this corrupt libertarian idea that we should be free to harm other people if we choose? Or does the prospect of being vaporized on the train along with the rest of the passengers by someone who had a bad day at work not appeal? So I ask, what kind of backwards country makes self-harm devices illegal, but other-harm devices legal? America, it seems, is the answer to that question. During the Conservatives first term in government (2010 - 2015), they made around £600 million of cuts to Legal Aid. 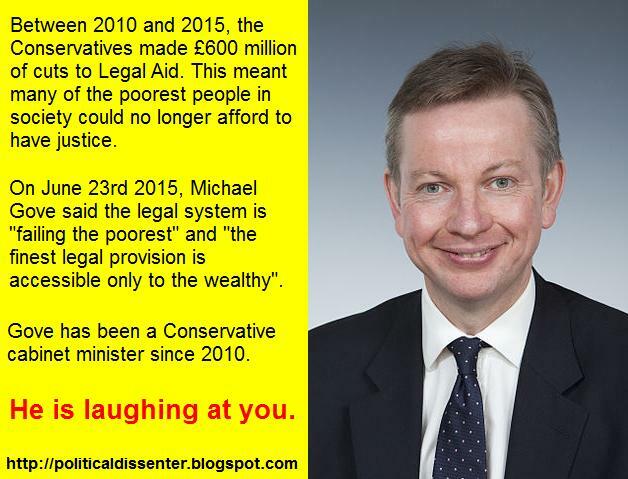 Today, the new Conservative Justice Minister, Michael Gove, said the legal system is "failing the poorest" and "the finest legal provision is accessible only to the wealthy". How Michael Gove can say this when he was a Conservative cabinet minister between 2010 and 2015 is almost beyond belief. The audacious and hypocritical speech was an insult to all who'd campaigned against the cuts to Legal Aid that have left the poorest in society unable to afford justice. Perhaps Gove's motivation for making this speech on June 23rd 2015 was the new play `The Invisible' which is due to open in 10 days time on July 3rd. The play is about people fighting for justice and having to represent themselves in court because they're not entitled to Legal Aid. It's based on the real life impact of Conservative cuts. Coincidence? I doubt it. The Conservatives have shown utter contempt for the poorest in society, and this latest speech by Michael Gove is his way of saying `we can get away with it'. Whether the mainstream media will pick up on this is unclear, but The Political Dissenter will do all it can to point out the hypocrisy and corruption of the current UK government. -UPDATE- (18/10/2015) Now it's being reported that 1 in 4 victims of domestic abuse are having to defend themselves in family court. Some are being cross-examined by their own abusers. Is Hillary Clinton Corrupt? Should She Be President? Hillary Clinton. Public Domain Image via Wiki Commons. Let me preface this by saying I'm a liberal democrat. However, if you're anything like me, you'll put partisan politics aside and consider the scale of corruption that Hillary Clinton has been involved in. In 2010, Wikileaks found that Clinton had ordered US diplomats to spy on UN officials. She asked them to gather biometric data, computer passwords, and credit card details. Though her name was on the order, she claimed it was affixed by someone else. In 2002, Hillary voted for the Iraq War and lied to us about WMDs. However, less is known about her attitude towards Iran. In 2007 she voted to label the Iranian Revolutionary Guard a terrorist organization, which could easily have led to war. Indeed, her support for Israel is emphatic, and her overall foreign policy is on a par with that of the previous Bush administration. Then there's her healthcare turnaround. After championing socialized health care in the 90's, Hillary's stance dramatically changed when she became the 2nd highest paid recipient of donations from the pharmaceutical and health insurance sector. Then, in 2009, Hillary came to the aid of a number of pharmaceutical companies who subsequently donated money to her husband's foundation. For her 2000 Senate campaign, she swindled a large amount of money from Peter Paul. Then, in 2008, she hired convicted thief, Sandy Berger, as an adviser. 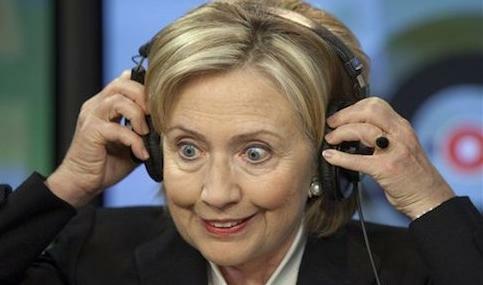 Her campaign ads that year used images of Bin Laden and Hurricane Katrina to scare people into voting for her. And, in 2012, she laughed at the death of Colonel Gaddafi in an interview. In 2013 there was the Benghazi scandal. She was accused of using propaganda to mislead the public about an assault on the US embassy. She denied knowing about multiple warnings of the impending attack, and used this as an excuse for withholding those warnings from the media in the aftermath. However, Clinton's aid had removed all mentions of terrorism, warnings, and al-Qaeda from reports, instead promoting the idea that it was a protest about a controversial book. Hillary denied giving the order, or even knowing about it. Then, of course, there's the personal email account that Hillary used to keep her Secretary of State business secret from the public. This was a breach of rules, and the latest in a long line of scandals to hit the press. Unfortunately, most people will remain ignorant of these scandals, or will consider them unimportant. Indeed, the majority of Hillary's supporters base their entire opinion of her on the fact that she's a woman who was cheated on. 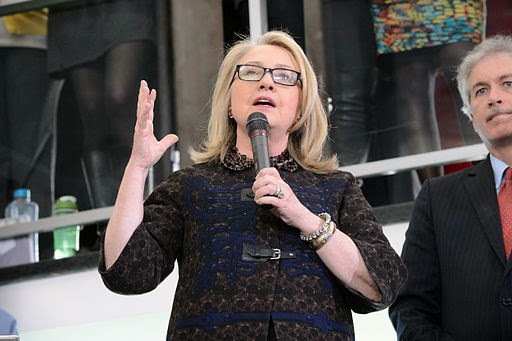 To learn more about Hillary's history of corruption, and to see sources for the information included in this post, please visit here. 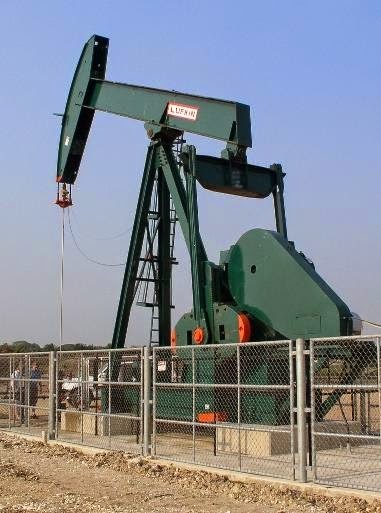 Oil well. Pic by Belizian via Wiki Commons. Despite preconceptions, Iran is a peaceful country that hasn't started a war in almost two centuries. However, in 1953, Great Britain sought American help when the Iranian Prime Minister, Mohammed Mossadegh, threatened to nationalize the country's oil industry. Britain had been mopping up Iran's natural resources for decades and desperately wanted nationalization to be avoided. So, America sent the CIA to organize a coup that would topple Mohammed Mossadegh from power. Named Operation Ajax, the coup succeeded in removing the democratically elected leader of the Iranian people. For denying the Iranians the right to choose their own leader, America may never be forgiven. However, what was truly unforgivable was the 26 years that followed. America and Britain installed Shah Pavlavi as their new puppet dictator in Iran. The Shah ruthlessly oppressed the population, using his SAVAK secret police to destroy any form of political opposition. Thousands of Iranians died or were tortured as a direct consequence of American actions in their country. Eventually, the Iranian revolution deposed the Shah in 1979 and installed the current theocratic regime (which America doesn't like, of course). After one year of freedom, America found another way to subject the Iranian people to unspeakable horror. Whether he was initially encouraged by America or not, Saddam Hussein sensed an opportunity to invade Iran in 1980, triggering an eight year war. Despite starting the Iran-Iraq war, Saddam received American support and weapons. His use of chemical weapons (WMDs) against the Iranians was even condoned by America at the UN. The United States repeatedly vetoed attempts by the UN to condemn Saddam's WMD use against the Iranians. After eight years, and many dead, the two nations agreed peace. With even a basic reading of history, it's not difficult to understand why many Iranians have a problem with America. Unfortunately, the American government relies on our ignorance of history when pushing for war with Iran, and our servile media reinforces this position by pretending animosity between the two countries started yesterday. Of course, not all Iranians hate America, but we should be very careful when condemning those that do, as their hatred is quite justified. Though Obama has pushed for closer ties with Iran, what really should happen is an apology. Unfortunately, the noxious level of patriotism and national pride in America would make this political suicide for any politician. 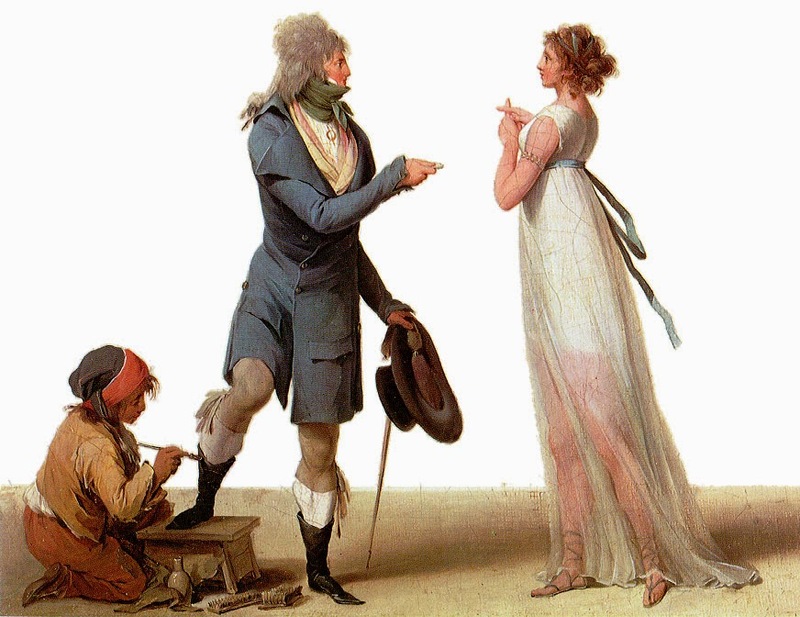 Prostitution is a contentious subject that tends to get people's emotions in a bit of a muddle. Many are morally against it, while others simply find it revolting. However, there are several practical reasons for why it should always be legal. 1. When prostitution is legal, it can be properly regulated. This means that prostitutes can work in licensed brothels with panic buttons, disease testing, clean living conditions, security, and a community of fellow prostitutes to help and protect them. It makes them less likely to be economically and sexually exploited by violent pimps. It also means the majority of their clients will be sad, lonely men who would never dream of being violent to a woman. 2. However, when prostitution is illegal, all of this goes away. The sad, lonely clients are too afraid to break the law, so many of the clients are abusive. The protection of the brothel is gone, meaning the women have to surreptitiously occupy alley-ways, or live alone so no-one can report them to the police. Most will have pimps who are involved in other criminal enterprises, and any brothels that remain will typically be run by the criminal underground. The end result is prostitutes who're at greater risk of disease, violence, drug addiction, and sexual and economic exploitation. 3. Although a small fraction of prostitutes are trafficked, there are already laws against this. There is no need to outlaw prostitution in order to stop trafficking because traffickers (by definition) will ignore whichever new laws are used to threaten their business. By legalizing and regulating prostitution, there is less of a business opportunity for traffickers (less demand to fill), and trafficking is likely to decrease as a result. 4. Many prostitutes are vulnerable products of their upbringing. They grew up in care homes, or they have drug habits to feed. So should society be exposing them to greater danger by making their work illegal? Or should we be protecting them and giving them help to overcome their problems? By bringing them into licensed brothels, they can be given the support they need from peers, social workers, and health professionals. For those who are against prostitution, this may actually be the best way to get prostitutes to change their ways. 5. Prostitution is a moral issue for some people. However, is it moral for a woman to pretend to like a man to get a piece of jewelry, a free meal, or a free holiday? In this instance, the man is being duped into parting with his money. With prostitution, there is no facade. The man knows the woman is being affectionate because she is being paid to. It's an honest transaction between two people, and a far cry from the dishonest tactics used in the dating game. From a libertarian perspective, prostitution is between two consenting adults who are fully aware of what they're doing and why. There should be no law to stop them from doing it. Most people in America and Europe are taught to believe that illegal drugs are inherently bad. However, there's little difference between legal and illegal drugs in terms of what they can do to your body. In fact, a majority of health and police professionals agree that legalizing drugs has the potential to reduce crime, expenditure, and the number of people dying from substance abuse. The remainder of this post presents 5 reasons why they hold his view. 1. The war on drugs has been a catastrophic and expensive failure, costing governments around the world 100 billion dollars every year. It's a ridiculous waste of public money. The botched attempt at alcohol prohibition in the 1920's should have shown lawmakers that making a narcotic illegal doesn't prevent people from taking it. Policing has also been extremely ineffective. Even in Afghanistan, where there was a huge US military presence, the opium trade reached record levels. A new strategy to combat drug use is required. 2. As a society, we are free to enact all manner of harm on our bodies and minds. We can eat until we die from heart failure, and smoke until we get lung cancer. 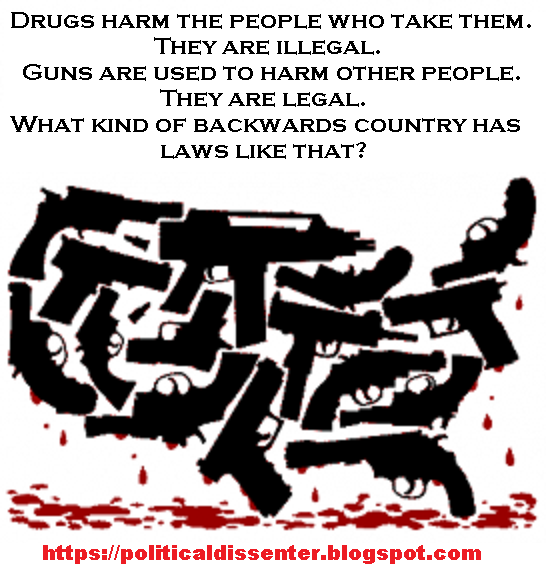 People who use drugs are harming their bodies, but that is their right in a free country. Your body is your property. Drug dealers are the real criminals because their objective is to increase the number of people who are abusing their bodies with drugs. So lets get a grip and stop locking up drug users. 3. The most effective way to close down a business is to undercut them and take their customers. The drug-dealing business is no different. Western governments should understand that the only way to end drug use is to control the market. If a government nationalized the drug trade; buying in bulk and selling to users for zero profit, all of the drug dealers in that country would be instantly forced out of business. The drive for new addicts would end. 4. 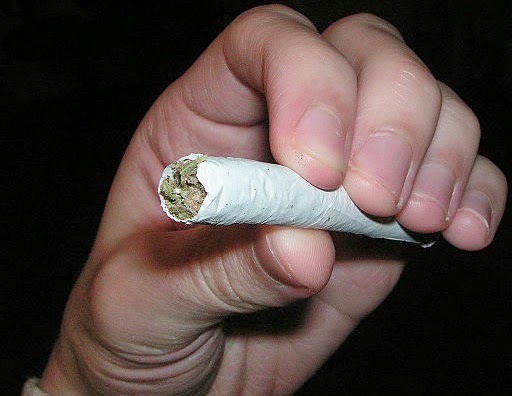 If drugs were legalized, something could be done about the problem. Users would have better access to health and rehabilitation services, and their habits could be moderated better by health professionals. The trendy image associated with drug use could be quashed and re-branded. It would be considered a health problem rather than a fashion choice, making it less attractive to the young and vulnerable. After a short time, sales could be restricted to those who have a preexisting addiction, meaning no new addicts would be created by the system. The dealers wouldn't be able to fill the gap. Any new addicts they manage to create would be immediately lost to the non-profit prices offered by the government. Eventually, the drugs problem would diminish and die out. 5. If drugs were sold legally at zero profit, most of the crime associated with the problem would go away. There would be fewer muggings and burglaries because users wouldn't have to find money to fund their habit. The crime associated with the drug-dealing enterprise would also vanish, though we could probably expect criminals to move into other vices such as gambling and prostitution. Legalization is a solution that makes sense to professionals working in the field. Lets start listening to them! Copyright 2014 Thomas Swan. Small post segments can be used with a link to the original. Picture Window theme. Powered by Blogger.